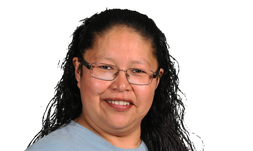 Originally from the Algonquin community of Long Point First Nation in Winneway, Bernadette was born in Ville-Marie and has been living in Val-d’Or for many years. In addition to being a mother of 4 children, she is a grandmother of 9 grandchildren and a great-grandmother of 4 great-grandchildren. As an active member of the Friendship Centre’s DO8DEI8IN Elders group, she actively participates in the many activities offered to the community. Bernadette is a very determined woman with a cheerful personality. Despite the difficulties she had to face in her life, she hangs on to her faith and takes up each challenge with an attitude full of hope for the future. She draws her strength and motivation from her children’s successes and the pride it gives her. Family relationships are very important to Bernadette and she cherishes the moments she spends with her grandchildren and great-grandchildren. In her view, transmitting Elders’ knowledge to young people is a great wealth and this is why she spends time teaching the Algonquin language to her grandchildren. Originally from the Algonquin community of Kitcisakik, Charlotte has been a part of the Friendship Centre’s family for quite some time now. She is known for her gentle spirit and wonderful personality, as well as her participation in the Centre’s many activities. One of her biggest passions in life is crafting. She enjoys beading and sewing and credits her own grandmother for hers skills in these crafts. Like her own kokom, Charlotte wishes to pass down her knowledge for the traditional arts to her own grandchildren. After having struggled with addiction, she achieved her goal of living a sober life and has since been living a full, wholesome life. She wishes good health and a drug-free world for the younger generations. Sana Gunn, a mother of 5 children and a young 42 year-old kokom from the community of Kitcisakik, is a true model of perseverance. Following her participation in the ODABI skills development program in 2013, Sana decided to go back to school. Last June, her efforts were rewarded as she obtained her high school diploma. Although she is currently working as an educator with the Abinodjic Migwam Early Childhood Centre, her objective is to obtain her Attestation of Collegial Studies in early childhood education. For Sana, being a model for her children is very important and thanks to them and to her husband’s support, she can muster the necessary strength to keep on moving and persevere in life. Congratulations, Sana, for all your efforts! Originally from the Algonquin community of Kitcisakik, Gloria Penosway is a young 36 year-old woman and mother of two children. Dedicated to their personal development and academic achievement, so is she for herself. Obtaining her attestation of collegial studies in early childhood education is a way to convey to her children the importance of believing in oneself and the reward of making the necessary efforts to reach one’s objectives. Gloria is constantly seeking to improve herself and she achieves that by going back to her roots in the forest or finding creative solutions to overcome obstacles. Besides her love for her children, Gloria loves music and she recently developed an interest for writing songs that she sings to the beat of the drum. Now an educator at the Abinodjic Migwam Early Childhood Centre, she appeals to her culture by playing drum to calm the children. Congratulations, Gloria, for your achievement, you can be proud of yourself! Shawn is an inspiration for all those around him. His kindness, motivation and dedication are contagious. An assiduous student, Shawn has a clear vision of his future and he knows this is the best way to achieve his goal. Despite occasional difficulties, he is convinced that he must attend school if he wants his dreams to come true. A budding carpenter, he would like to make a career out of it. In the meantime, Shawn regularly practices baseball and gets involved in his community and the Friendship Centre where he displays innate leadership. Adrienne is a young 18 year-old Algonquin from the Long Point First Nation in Winneway. She is a role model not only for the younger generations, but also for her family as she will be the first one to obtain her high school diploma. 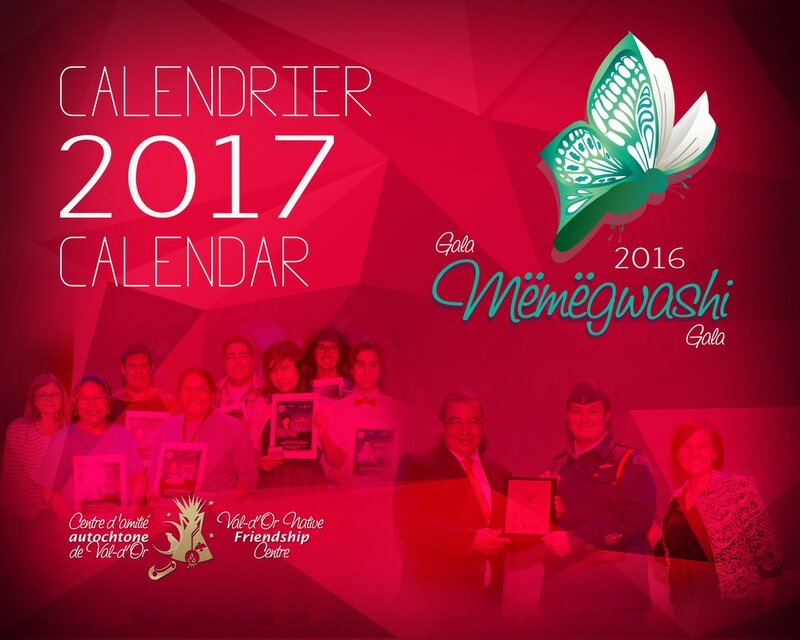 Knowing that the purpose of the Mëmëgwashi Gala is to encourage school perseverance, she has been participating in it for many years. Excelling, setting goals and making every effort to succeed is what motivates her to devote herself more than fully to her studies. This is also the case when she goes to the gym and practices cross fit. Keeping top shape is a must and will be beneficial to the profession of police officer she wants to exercise. When we see her high level of motivation, it is a pleasure for us to acknowledge her efforts. Her strength and character traits will help her regardless of the path she will choose. Magalie is an incredible, impressive and gifted young lady. As an 11-year old, she already demonstrates her full potential. Whether it be the eloquent way she expresses herself, her determination and capacity to take up new challenges or her involvement in her school, Magali shows a lot of maturity for her age. Magali is bursting with talent, either as facilitator with the “Pause-Action” program, or when she plays traverse flute, or again when her fingers gently brush over the keys of the piano. Writing skills is also part of her talents. Her ideas become words converted into writings that are shared in the student newspaper. She is continuously enhancing her talents. At school, she works hard and makes every effort that she is capable of. She knows that she must use good methods if she wants to achieve her goals and become self-reliant. Already fascinated by the stars, she observes them with her telescope. The profession of astronomer will allow her deepening her knowledge. But for the time being, she perseveres, continues to grow, develops her many talents and, who knows, she may discover new ones? Brandon Laforest is an easy-going, 10-year old Algonquin boy from Val-d’Or. With his welcoming spirit and contagious energy, Brandon has been quite involved in the Centre’s programming. Whether by joining the summer day camp or attending the Gabriel Commanda walk and the National Aboriginal Day concert, he is always active within the urban indigenous community. Brandon is a hands-on type of boy; he loves drawing and building model cars with Lego pieces. When it comes to education, his favourite school subject is Science and Technology. In the future, he would like to be an engineer, so he knows full well that working hard and attending school will allow him to achieve that goal. Jessy Diamond is an 8 year old Cree Algonquin boy who was born in Val-d’Or. He is one of the most gentle, calm and kind hearted children around, which makes him a friend to all and an amazing role model. He is also very compassionate, and if ever faced with a friend who was feeling sad, Jessy would show his support by comforting them and bringing them to a teacher or an adult. In school, Jessy’s favourite subject is Mathematics but like most kids, he also loves to play and do activities with his school buddies. At home, as well as at the Center’s summer day camp, Jessy enjoys baking and cooking and we know firsthand that he is very good at it! Noemie is 10 years old and she entered grade 5 at St-Sauveur School. She has always been living in Val-d’Or with her family. Born in a large family, Noemie has 4 brothers and 6 sisters. She can play her role both as big and little sister by using her older siblings as models. When she is faced with difficult situations or obstacles, she turns to her big sisters. On their part, her sisters always support, help and encourage her. Noemie has beautiful human qualities that make her a loving young girl. She has an innate kindness rooted in herself. She is very respectful of people around her and those she comes across because for her, respect is very important. With such qualities, no doubt that she will achieve her dream of becoming an elementary school teacher. Pursue your personal growth, Noemie, you are a wonderful little girl! Cèdre is a 5 year-old Cree Métis living in Senneterre with his father and his younger brother. He graduated last June from the Senneterre Friendship Centre’s Early Childhood and Family Service. He entered kindergarten this year and enjoys it so much that he does not want to go back home at the end of the day. He even asked his dad to enrol him in the noontime and evening daycare service because he likes to be in school with his friends. Cèdre already demonstrates a few aspects of his personality that will serve him well throughout his life. He is a little boy who loves being stimulated, either by learning or by everything around him. He also has a lot of ambition; he is shy but very sociable and perseverant. When discussing with his father about how he sees himself as a grown up, he says with a mischievous look that he will have a big truck, drive big trucks and make a lot of money. This is maybe why he would like to work for Via Rail, in railroad transportation or in the mining industry. But for the time being, he is just a little energetic boy who loves playing outside, riding his bike, jumping on the trampoline and, above all, playing in inflatables. Five year-old Logan Dekeyser graduated from the Early Childhood and Family Service last June. In September, he entered kindergarten at the Golden Valley School. The fourth child of a family of five, Logan is a wonderful big brother. He loves taking care of his little sister, whom he calls “my baby”, and younger children. Despite his shyness, he is a very funny little boy who likes making people laugh. Having not thought about what he would like to be in the future, what matters for him now is having a good time with his best friend Jayden, playing ball and skating in the winter. Even if he sometimes fall down on his skates, he continues on and perseveres.